An excessive intake of chocolate, as well as coffee, tea or caffeinated sodas, can be lethal to pets. Puppies and young dogs in particular may be more likely to ingest large amounts of unusual foods. 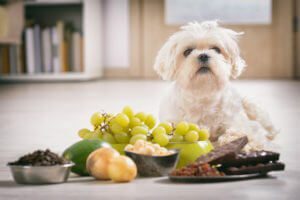 Although dogs are the most susceptible, the toxic compound in these foods (chocolate, coffee, tea and caffeinated sodas) has also been known to affect or kill cats, birds, rodents and reptiles. Chocolate toxicity (poisoning) is caused by excessive intake of the methylxanthine alkaloids in chocolate, coffee, tea and caffeinated sodas. The active ingredient in chocolate is theobromine. The poisoning affects many organ systems, and animals of all ages are susceptible. Every animal has varying levels of sensitivity to theobromine, and caffeine will enhance the toxicity of theobromine. Some brands of chocolate have more caffeine than others (e.g. Nestle’s milk chocolate has 19 mg caffeine per ounce while Hershey’s milk chocolate has eight mg caffeine per ounce). Symptoms of chocolate poisoning include vomiting, diarrhea, hyperactivity, restlessness, excessive urination and muscle tremors. Vomiting and diarrhea can occur two to four hours after intake. Advanced signs (seizures, heart failure, coma and death) can occur 12 to 36 hours after intake. If your pet has just ingested chocolate or one of the other related toxic items mentioned above, immediately take your pet to an emergency hospital. There is no antidote for chocolate poisoning. However, veterinarians may induce vomiting, administer activated charcoal, and/or provide intravenous fluid or oxygen to help flush toxins out of the body. Additionally, your pet’s cardiovascular system will be monitored, and if necessary, medication may be given to treat an irregular heartbeat. If the ingestion and treatment are performed in the first four hours, the prognosis is good. Patients usually recover with aggressive supportive therapy under the direction of a veterinarian.